The Shift series has been around since 2008, when the first Shift title debuted as a Flash game. Four mainline games have released since then, with the first two receiving iOS ports as well. 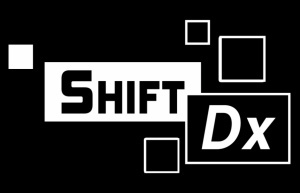 Shift DX collects all the levels from the first two games and introduces 100 more to the 3DS; we consider whether this is a treat for puzzle fans or if you should stick to the free versions elsewhere. Shift DX is a puzzle-platformer with a decidedly simple aesthetic. You play as an unnamed female character who is a test subject in some sort of laboratory consisting entirely of black and white. Aside from jumping, your only ability is to shift between the black and white parts of the screen. Pressing L or R turns the screen upside down and shifts you onto the other colour, reversing gravity with it. It sounds complex, but after a few quick intro levels you'll have everything figured out. 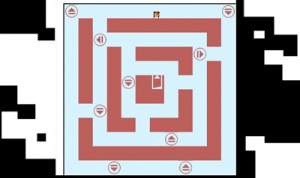 The game introduces a few new mechanics in the first few dozen levels, such as keys that move doors and gravity-manipulating buttons, but nothing ever gets overwhelming. This is helped in part by small levels that you can easily clear in just a minute or two, making the game a great fit for bits of on-the-go fun. You won't find much story in this one, unsurprisingly with its roots as an online game. Some levels feature on-screen text from whoever is conducting the tests and watching you, and while it's somewhat interesting it never reaches the great heights of Portal, which featured a similar concept. 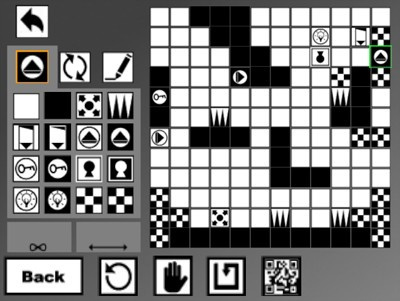 Shift DX is definitely an accessible puzzle game. We were hardly ever stumped in our time with the game's first 50 levels, and the lower screen allows you to place a flag anywhere and return to it at any time. This allows less experienced players to create their own checkpoints, but is totally optional if you find it makes the game too easy. Speaking of difficulty, the curve in Shift can be slightly off. 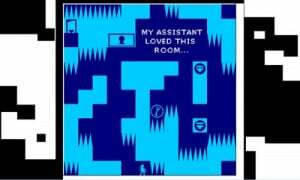 Some early levels seem to spike in complexity out of nowhere, while one or two later levels are a simple affair (sometimes the game even acknowledges these). It's not a huge issue, but definitely hurts the feeling of progression. Aside from the main game, Shift DX features a few extras that you unlock along the way. Challenge Mode tasks you with completing levels from the main game only using a certain number of jumps and shifts, but unfortunately doesn't feature any leaderboards. 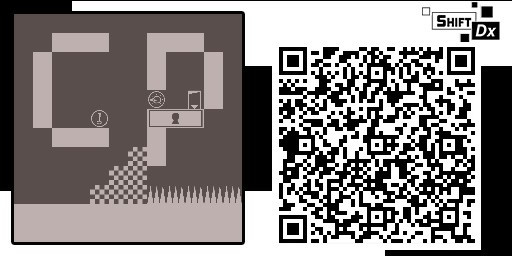 There's also a level editor that lets you create your own stages and share them with friends via QR codes. Finally, you'll receive some alternate skins that change up both the colors and your character, including a cameo appearance from BIT.TRIP's Commander Video. The black and white look is simple but works well for the game. Unfortunately there's no 3D effect, which would have looked great with the minimal graphics. You'll also hear a few different music tracks swapping off after every level. They're energetic and sound great, but you might tire of them during longer play sessions. We only have a few minor nitpicks about Shift. The aspect ratio of the game screen results in black and white drawings on either edge, which can be a bit confusing when you're trying to see where the actual black and white boundaries of the level lie. Additionally, the use of the touch screen for the level editor is great, but you can't resume the game from the pause menu or navigate any menus using the buttons. We're not sure why these actions require use of the touch screen. What we have here is a great puzzler for the 3DS. 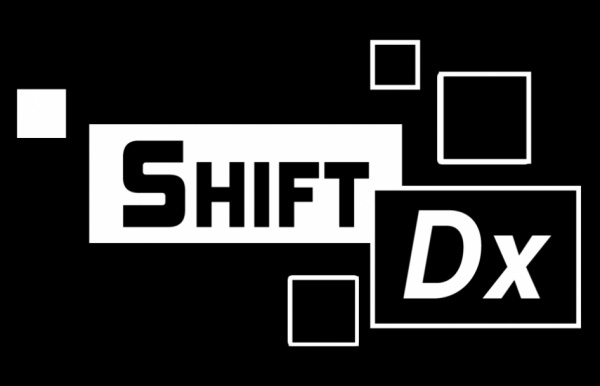 Don't let the simplistic graphics and basic controls distract you from the fun gameplay you'll experience in Shift DX. Aside from a few weird spikes, the difficulty is forgiving for new players but also challenging at points for puzzle veterans. The price tag is also just right for the amount of content you get; playing these two games free on iOS means putting up with ads every time you die. Shift DX takes a simple concept and creates plenty of fun levels out of it. Anyone who enjoys this genre or has a small interest in it should definitely pick this one up. I hadn't heard of this game before but it looks great. I'll pick it up at some point. Wasn't going to bother from the game description but having read the review I think it is worth a pick up! If I can get my hands on it, then Shifting World will have its companion game. Thanks for the review, I was already interested in the game and will likely grab it soon. One question - I noticed the comment on not being able to use button controls in menus, etc., which is really annoying to me. Any idea why the Super Mario Maker 3DS review didn't mention that fact? It is SUPER annoying to me in that game since you have to grab the stylus constantly when getting medals / playing Super Mario Challenge. I know it's a different reviewer, but it would be nice if control issues like this were always highlighted. Are there many sites to get qr codes? Usually I just do google images for qr codes but that limited. It is annoying but I just tap with my finger nail. Leave the stylus where it is. @Other-Brother I rather use a fingertip myself. I'm not too sure on this game but might give it a try at some point.